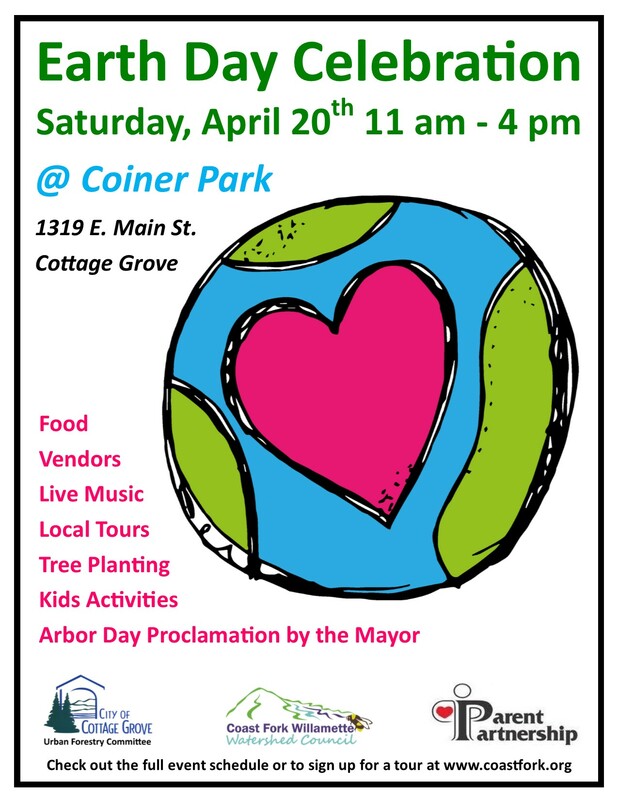 The 2019 Earth Day Celebration will take place on Saturday, April 20th from 11 am to 4 pm at Coiner Park, 1319 East Main Street in Cottage Grove. Fun for the whole family, the event is free and open to the public. The event will feature 3 local tours, live music all day, an Arbor Day Proclamation by the Mayor of Cottage Grove, informational booths hosted by community organizations, local vendors, kids’ activities, food, and a rummage sale benefiting the Friends of the Swinging Bridge. 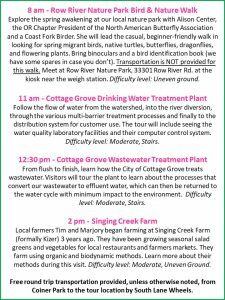 The FREE tours will take place at the City of Cottage Grove Drinking Water Treatment Plant (11 am), City of Cottage Grove Wastewater Treatment Plant (12:30 pm) and Singing Creek Farm (2 pm). Tour Details: Round trip transportation from Coiner Park to each tour location will be provided by South Lane Wheels at no cost to participants. Tour sign up is available with the Cottage Grove Library, please call 541-942-3828 or visit 700 E. Gibbs Ave., Cottage Grove to reserve your spot on the local site tour(s) of your choice. 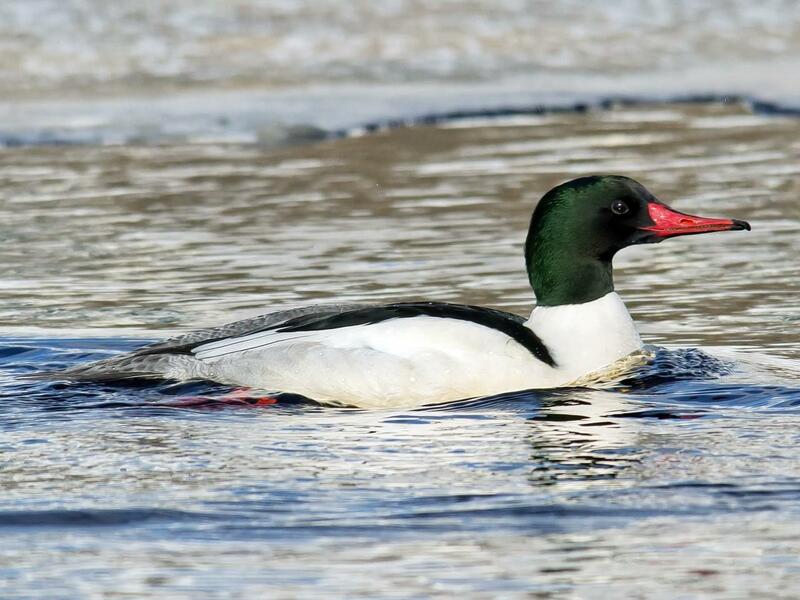 Last day to reserve a spot on a tour will be Thursday, April 18th. If any spots remain, they will be filled on a first-come first-serve basis on the day of. The Earth Day Celebration is put on by the Coast Fork Willamette Watershed Council, the City of Cottage Grove’s Urban Forestry Commission, and Parent Partnership. 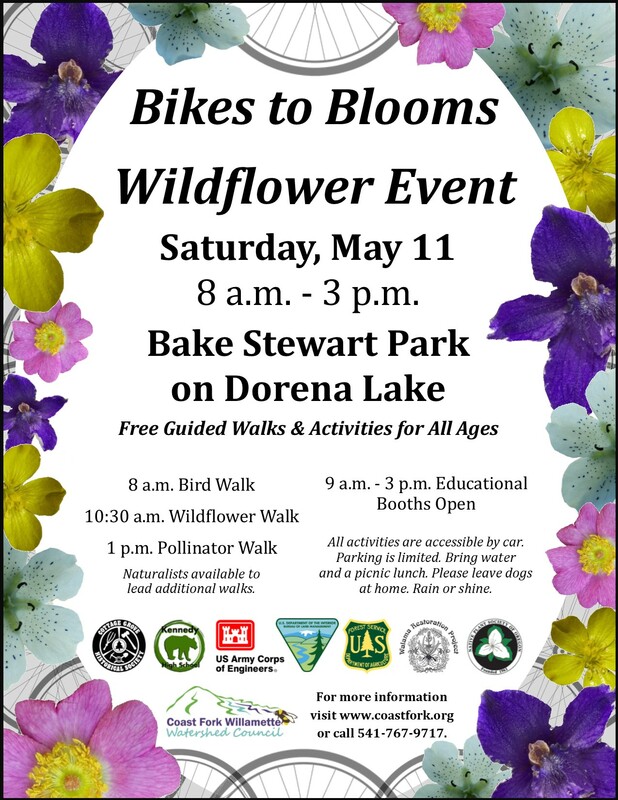 Event information can be found at on the Coast Fork Willamette Watershed Council Facebook pagewww.facebook.com/CoastFork. 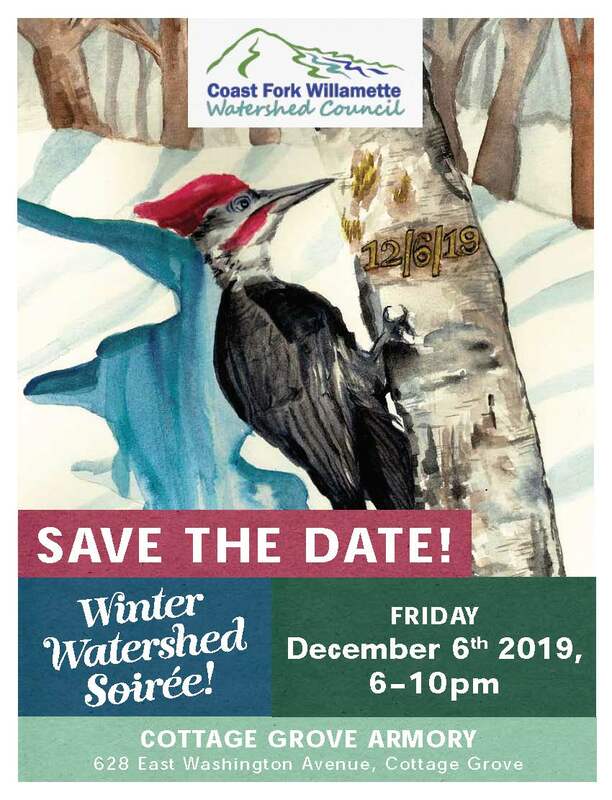 For more information please contact Reilly at the Coast Fork Willamette Watershed Council office at 541-767-9717 or by email at reilly@coastfork.org.